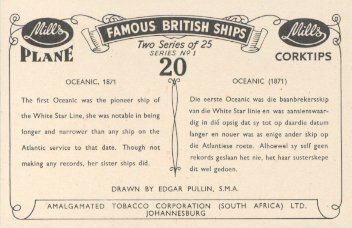 White Star's first Oceanic was a "first" in many ways. She was the first ship built for White Star after Thomas Ismay acquired the name and house flag of an insolvent line which traded primarily to Australia. She was the first ship built for White Star by the Belfast firm of Harland & Wolff under an informal agreement that was to last until White Star ceased to exist in 1934. (Under that agreement, Harland & Wolff did not build ships for any White Star competitor; White Star bought ships from no builder other than Harland & Wolff; and all ships, except Laurentic II, were built on a "cost plus" basis, which guaranteed a profit for the builder.) And she was the first to carry the name "Oceanic", derived from the formal name of her owner, the Oceanic Steam Navigation Co., Ltd.
Oceanic was also "[t]he first important example of White Star's 'radical' ships," which would regularly set new industry standards. Her length to beam ration was 10:1, rather than the 8:1 which had been customary; and on deck, heavy bulwarks were replaced by modern railings. Her first class accommodations were amidships rather than aft, to reduce the noise and vibration felt by their occupants. The first class dining saloon extended the width of the ship and featured large scuttles and individual chairs rather than lengthy benches. Passenger cabins far outdistanced others of their day in comfort, luxury and modern conveniences. Oceanic's maiden voyage, however, was far from an auspicious one. Soon after she left Liverpool for New York on 2 March 1871, her engine overheated and she was forced to return home. She left again on 16 March, finally arriving in New York twelve days later. Her arrival marked White Star's first appearance in New York, a port which the line's ships would visit regularly until 1960. 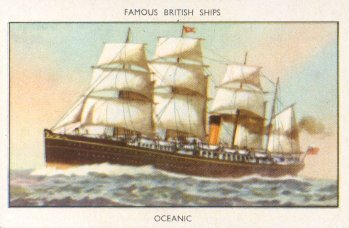 Oceanic remained on the Liverpool-New York route until 1875, when Britannic I entered service. She then began twenty years of service on the Pacific, on a Hong Kong-Yokahama-San Francisco route operated jointly by White Star and the Occidental and Oriental Steamship Co. (White Star provided the ships and officers. O&O provided the crew.) She set transpacific crossing records in 1875, 1876 and 1889, returning to Liverpool only once, for a refit in 1879. In 1895, she was sent to Harland & Wolff for new engines to be installed, but after she was thoroughly inspected that plan was abandoned. Instead, Oceanic was sold for scrapping and headed to the shipbreakers in London in February 1896. Sources: Bonsor's North Atlantic Seaway; Haws' Merchant Fleets; The New York Times, 27 November 1960.